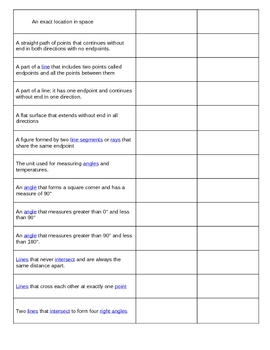 This 2 page printable is an all time favorite in my school and learning community. 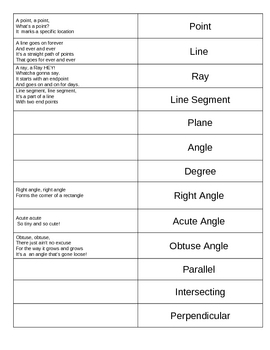 I designed it to be printed on both sides of a sheet so that students can simply fold in half, cut along the black line and VOILA they have a flip book of essential geometry vocabulary. On the front of the booklet tabs you find the name of the term. When the panel is flipped back, you see a definition of the terms and then a space where students can draw in the symbols or other important graphics related to the vocabulary word. On the very back of the booklet are printed raps you can perform with your students to help set in the meanings of each vocabulary word. My kids year after year have truly FLIPPED for the booklets and raps making this a very enjoyable lessons to teach!